Cyborg and the Justice League are in all out attack mode on the villainous Darkseid. On Apokalips de-masked batman locates Superman who’s being tortured by Dessad. 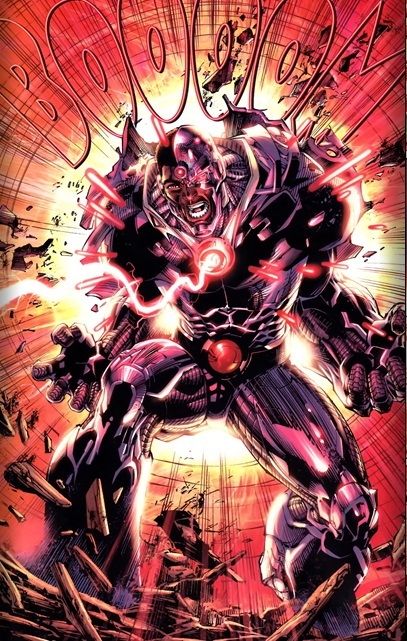 On earth Cyborg connects with the mother boxes of Apokalips to bring Superman and Batman from the alien world and send Darkseid back home, he vows to return! Having saved the day our heroes get thunderous applause and cheers. That is how the new Justice League came together! Cyborg– Ladies and gentlemen Cyborg is officially the coolest member of this rag tag team. Who saved the day? Cyborg! Who is the only person to have any type of development over these first six issues? Cyborg! Mysterious undefined powers and arguably cooler than he was before the DC reboot? My man Cyborg! I like it! 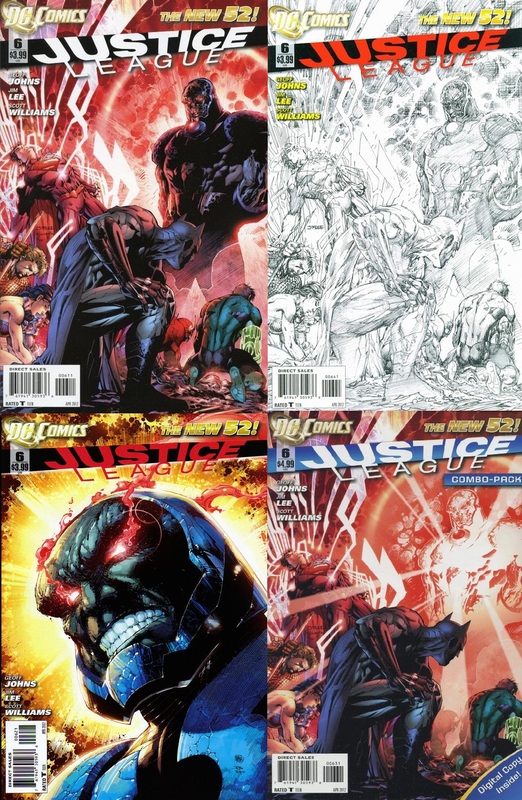 Covers- The standard cover features the Justice League kneeling in front of the mighty Darkseid while Superman is skewered on some red crystals; the color red radiates everywhere, gorgeous! The other cover is a sketch with detailed pencils and pens, lovely! Another cover is a close up of Darkseid’s eyes as the fire from his eyes blowing in the wind, simply stunning! All around every cover is worthy of praise thanks to Jim Lee’s awesome work. Action-The entire issue was one big fight the new Justice league is one deadly bunch! Wonder woman and Aquaman in particular went straight for Darkseid’s eyes….brutal! Art- Jim Lee you old dog your art takes me way back to the 90’s when your work was all the rage….and home boy still has it! Everything was lovely! New development- In the past Darkseid had many sons, three by my memory in the new DCU he has a daughter and she’s the reason he invaded earth…he’s searching for his lil girl…..interesting.